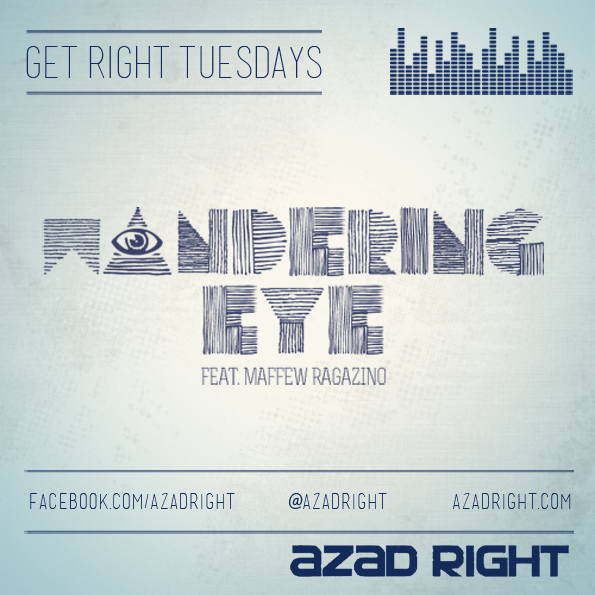 Perhaps a little late on the up given that "Wandering Eye" is a track that dropped last Tuesday as part of Azad Right's "Get Right Tuesday" series, but that definitely doesn't make the song any less dope and for those who aren't familiar with Azad and the new series, something to look forward to from the California rapper in the coming week. "Wandering Eye" is all about a relatable topic for pretty much everyone, men and women alike, physical attraction to someone who isn't your significant other. It features two bars and a hook from Azad and a feature verse from Brooklyn native, Maffew Ragazino. The beat is by California producer Kalby, who really sets off the song from the start with a great guitar riff layered atop of keys that slowly progresses as the song goes on. Refreshing to hear a Hip-Hop instrumental that isn't centred around the drums of the song, instead the smooth electric guitar carries the spotlight. Azad Right will be dropping his new project around fall, entitled For The Hopeful.